Our chairman is Roy Stanhope Black Belt 9th Dan, a Martial Artist with over forty years experience. Sensei Stanhope has a vast knowledge of many major styles of Karate, a pre-requisite for running a multi-style organisation such as the United Kingdom All Styles Karate Organisation. He holds Dan grades in Shukokai, Shotokan and Wado Ryu. In the past he has represented Great Britain at international level and has also held the prestigious posts of England Team Manager and British Team Coach. In addition to holding the position of chairman of the United Kingdom All Styles Karate Organisation, Mr Stanhope is also chairman of the United Kingdom Martial Arts Federation and president of the World Union of Karate Associations. The following is an in-depth interview conducted by Combat/Traditional Karate Magazines with Sensei Stanhope and reveals some of his unique personal history. When and how did you become involved with the Martial Arts? It was in 1962 and the only thing I knew about martial arts was the wood breaking that you read in all the newspapers at that time. I was going to a youth club at the time and I went on a judo course. We used to have a fantastic Judo club in Manchester called the Kita Nishi Kwan with its own resident Japanese teaching Judo there, but I was thrown about so much I got constant headaches for three or four months. I thought "This degree of contact isn't for me!" Then I read an editorial about Karate in the local paper and went along to the club they mentioned. I turned up at the end of the class so I didn't know what to expect. But I'd paid my fees so I went along the following week. It was nothing like I'd expected. I thought I would learn how to break things and impress people. I was only 16 years of age at the time and I suppose it was ego that got me involved. I began in Wado Ryu which was a very loose sort of a style in those days. There weren't that many instructors around and those we had, learned their more advanced techniques from books. There were just two books available then - Mas Oyama's and Nishiyama's - and just about every Instructor was using them! Then the Japanese came over and we joined them. Why did you subsequently change from Wado Ryu to Shukokai? It was a political decision. I was running two clubs in the North of England (Sheffield and Manchester) and l was very much involved with the England team as a competitor at that time. We won the British championships in 1966 and we won it again in 1968, and I had some super guys with me (Peter Consterdine and of course Stan Knighton, who was my top student at the time) but none of them were ever considered for selection to the British team. So we fell out with the British Karate Association under Len Palmer because I wasn't happy with how they represented us on the British Karate Control Commission. We asked Len to boycott the selection to the English team because the BKA wasn't getting its fair share of places. He agreed but unbeknown to us, the Southern based BKA clubs went ahead and attended the selection. Len was probably too nice a guy for the political issues involved. We were gob smacked when we found out! It was at that time that Kimura first visited the UK and his style was Shukokai. I was going to go down the London to the Kimura course with Bob Aikman but something cropped up and I couldn't go, so Bob went down and was full of what he'd learned when he came back, he just couldn't stop talking about it. We got the Northern clubs together and arranged a course with Sensei Kimura. After that I was hooked on Shukokai. Sensei Kimura came to my house with Bob and he was wanting someone to set up an association for him. At first he thought I was too young to spearhead this association but after I speaking to me for a couple of hours he changed his mind. Apart from Wado Ryu and Shukokai, have you practiced any other styles of Karate? I also practiced Shotokan Karate but I can't remember for how long, about 18 months I suppose. I took a Dan grading with both Nakayama and Nishiyama during a course at Crystal Palace, because the BKA had fallen out with Tatsuo Suzuki and we were left in limbo, so the KUGB came along an offered a helping hand. The KUGB was nothing like the size it is now and quite a few BKA clubs took advantage of the offer and joined them. Looking back, there were aspects of Shotokan that I liked and aspects which I didn't like, but I can't say what exactly there was about it that didn't fit. So what was it about Shukokai that did "fit"? I loved the introduction of impact pads. They were portable and whereas all the other schools trained against thin air, we used the pads. I used to practice against punch bags and I remember how the techniques I practiced against thin air didn't exactly move the bag about! I think that's a real problem with thin air training, it gives you a false sense of power, whereas the pads did exactly what they were intended to. You could feel the recoil and you could see how it affected your partner. I very much took to the style because of that. How would you describe your relationship with Sensei Kimura? Well, there were times when we were close and socialised a great deal. As the Chief Instructor in Japan, he socialised with the Chief Instructor in England, which is how they operate. The problem was, when things weren't going his way, I had to take the brunt. One thing he didn't like was the way in which associations arrived at decisions democratically, because as far as he was concerned, the Chief Instructor is responsible for the association. So he and I fell out on one or two occasions which ended up with the Shukokai Karate Union parting company with Kimura. Was leaving Kimura difficult for you? We had quite a few senior instructors by that time, so we were able to go our own way. That was when Kimura linked up with Eddie Daniels's Shukokai Karate Federation. So on the professional level, leaving Kimura had little effect but on the personal level, I was sorry about it. When was your first black belt grading? That was in 1966 under Tatsuo Suzuki and it cost me about five pounds. I did all the basics, all the kata (from basic to advanced) and sparring without a break. It must have been about 120 degrees in the dojo! I was the only one taking Dan grade. It just so happened that Suzuki Sensei was coming to another club in Manchester and he simply tacked my grading to the end of his course. It was weeks after that I discovered I'd passed! My second Dan was in 1970/1 and it coincided with the Japanese leaving the BKA. I took it at a BKA course. We began to use French Wado Ryu people like Guy Sauvin and it was he who graded me to second Dan. I took my third Dan under Kimura and failed it first time (it was a political thing based on the Japanese idea of holding people back). I asked him why he'd failed me and he said "your hip action was too slow," which was strange for a second Dan grading to third Dan. I took my fourth Dan with a Shukokai Dan grade named Suzuki. He was the European representative for Shukokai and was based in Brussels as a representative of a Japanese car firm. That fourth Dan grading was nothing like those I'd taken earlier, it was purely technical, kata and sparring. I remember that the sparring was quite hard because they had quite a few high grade Japanese students studying in Brussels and all of them had this thing about proving themselves against Western Karateka. So in that sense it was hard. Was training much different in the 1960's to how it is today? Yes it was. If you were collapsing from exhaustion, then you would say you've had a good training session. In terms of number of techniques, though, the lesson content was very limited. This was because instructors of that time didn't have the number of techniques to teach, so they did the next best thing and marched you up and down until you dropped. Now it's a lot more technical. There's always a tendency for people in any sport to think the earlier players were somehow better or stronger but the fact is, things have moved on. If you look at today's top people, I think you can say that they work as hard as anyone I've ever seen since I began. Nowadays, lessons seem to be half training/half enjoyment. The point is that there weren't many clubs about all those years ago so if you didn't like it, then tough luck! There was nowhere else to go. Nowadays a professional instructor has to be very careful, he has to be half instructor and half entertainer to be commercially successful. There are also now many restrictions on what you can and cannot do, especially where teaching children is concerned. You cannot, for example, mismatch training partners, yet you are supposed to be giving a child the confidence to deal with larger opponents! So I think that aspect of training the spirit has been lost. Fifteen or twenty years ago adults were in the majority but now the situation has changed, and I don't think for the better. Teaching children is quite difficult and we tend to lose so many of them to competing leisure interests as they grow older. I don't know where the next generation of elite performers are going to come from, when there are so many clubs are struggling nowadays to put together an adult team! Was competition as important then as it is now? Yes, very much so. It was a way of showing that what you were learning was better and that you had an edge over other Karateka. I represented England on quite a few occasions at European level, I don't think a World body had been established at that time, so I never took part in a World event. I represented England as a brown belt, along with Peter Spanton, who was also a brown belt at the time, and Ticky was a kyu grade, there weren't that many black belts about then. There were no weight categories in those days which made it difficult for me because I was very light. Nowadays, the more medals you give out, the more people come back next year and that's as true at international level as it is at national level. But in a supposed non-contact sport, what effect does a weight difference of, say, four kilos have? Things have now swung the other way, I believe that there are too many weight categories now. I was very much into competition then, although now I think too much emphasis is placed upon it. I find it strange that you can talk about the same technique in two quite different ways. Two lessons can contain exactly the same techniques except that in one, the instructor will be talking about how to score points and in the other, how to use the technique for self defence! What was your greatest international triumph? That would be back in 1976 when we won the European Championships in Teheran. The trophies were given out by a Princess who was the sister of the Shah of Persia. I was the Team Manager then. I also had a memorable match in South Africa, when they put forward a mixed race team against us. It was a successful tour but the press took it the wrong way and accused us of sneaking out of the country to avoid the Anti-Apartheid demonstrators. So how would you compare the likes of yourself, Ticky Donovan and Brian Fitkin with modern champions? I see the modem champions as point scoring machines and if that is the sole criteria for winning a competition, then the present people have got the edge. But when you look back at people like Ticky, Valera, Codrington, you are seeing Karateka with lots of flair as well as being point scorers. These people used lots of techniques. Today's world champions are incredibly fast and have impeccable timing, though they are no physically fitter than the Karateka of yesteryear and they tend to use less in the way of techniques. I personally think that today's competition is less interesting to watch than it used to be. Who would you single out from yesteryear for a special mention? Ticky Donovan in terms of his success with the British team, Vic Charles in terms of sheer ability as a competitor, Wayne Otto as a fine example of a modern World Class Karateka, Yosh Nanbu as one of the best all-round Karateka I've ever seen and Kimura as the hardest puncher and an old colleague, Brian Fitkin, who had strength, flexibility, speed, in fact he was probably the greatest practical Karateka I've ever trained with. I was the England Team Manage when Brian Fitkin was sent to Sweden. I remember how I always wanted to bring him back for squad selections because I knew he had a lot to offer, but my request didn't go down at all well with certain members of the BKCC at that time! How did you come to be made team manager? I was made Team Manager basically because of my overall experience! Steve Arneil resigned and as I was Chief Referee at the time I was offered the job. The two positions complimented each other, because I held a European Referee qualification at the time. I knew the rules inside out, so when I questioned a decision, people would listen. I was England Team Manager from 1976-9 and I was coach to the British Team before they went to Japan (in 1978). Britain never made an effort to come together until they had something like a world championships. Had they worked together, I'm sure they would have achieved greater results. We had a great team at the time, with Ticky Donovan, Tyrone White, Eugene Codrington, Stan Knighton and Davie Coulter from Scotland. Of all the fighters you've mentioned, who would you regards as the best all round fighter? Brian Fitkin without a doubt! He's very good with both his hands and his feet. He's the type of person who could lay you out with any technique you care to mention, and then use that same technique with control in a non-contact environment. There are very few people who have that skill. Another guy who had the same ability was Steve Babbs from Lau Gar. He was flamboyant and he was also a points scorer when the need arose. Do you regards Karate as an art or a sport? Very much as an art! Fifteen or twenty years ago I was still very much into competition, so I might have felt differently then. In terms of testing your techniques, there's a lot wrong with a tournament, but what else have we got? How else can we put things together and test ourselves? The ultimate test, I suppose, is full contact. How about UFC and no-holds barred fighting? I don't like it! For me, Thai boxing is about as far as you should go, and even there I don't like the brutality of parts of it such as using the elbow for example. The idea of deliberately trying to maim an opponent is a bit barbaric. I think the UFC promoters use the title 'Martial Art' for commercial purposes only. What do you dislike about the present martial arts climate and what do you hate most about modern day practice? Governing bodies with delusions of grandeur, and without naming names, I'd say the lack of discipline at some well-known tournaments. I've had abuse from nine and ten year olds, which leaves me wondering what we are turning out! Do they suddenly turn into angels at school? I also dislike those instructors who, because of their ego's believe they've got to be better than their students. The coach of Manchester United football team is not as good as his individual players, but what he has got are management skills. On the other hand, I think that many times club coaches don't get the recognition they deserve for the fighters who go on from their club to represent and win medals for this country. What would you say Karate has given you? It's definitely been responsible for my fitness with the discipline of training and peer pressure keeping me going. It's true what they say, gaining your black belt is only the beginning, because you feel that you have to justify your grade! If you are a second Dan, then the public expect you to be twice as good as a first Dan, and this goes on up the grades, so the pressure is kept on you and that's why I've never let myself go. I believe that a Karateka is an athlete and should be fit. Regrettably, such a lot of people reach Dan grade and then ease off therefore ending up out of condition. What do you think of musical forms? I was very much instrumental in introducing these to Britain through the FSK many years ago. I enjoyed them tremendously, but they never realty caught on. Even now, musical forms are not well supported, which is a shame. The top people at musical forms are absolutely fantastic, but those immediately below them don't seem to want to put the work in to aspire to their level. In some cases they just leave and go into what I regard as lesser forms of competition. I was very interested in Nunchaku in particular, and a few of the Japanese the association brought over were good with it. I also got into Sai and Tonfa. I remember looking at kids who picked these weapons up during the Bruce Lee boom and just juggled with them! They were awesome, much better than I was. I suppose I was thinking of the Nunchaku as a weapon, whereas they were just playing with them. Which would you say was the most important event in your career? There are probably two such instances, the first being starting the SKU with Kimura, which meant starting an organisation of a different style completely from scratch. The second would be the formation of UKASKO back in 1983. That gave me a lot of personal satisfaction. I was chief Instructor of SKU and yet I was constantly struggling to introduce new concepts, such as weapons courses with the other senior members of the Association. If you won the lottery, what do you see yourself doing with the money? 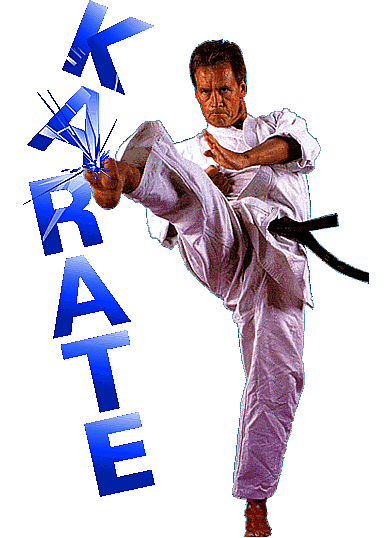 I'd pay professional instructors to teach underprivileged kids for nothing, because Karate has so much to offer. It can be so expensive for a single parent family,because when their kids see the Power Rangers, they have the same aspirations as everyone else. Why did you agree to become a trustee of the BUDO charity? There were a number of reasons. I wanted to help clean up the image of the Martial Arts and I wanted to see disadvantaged children getting the same chances as everyone else. I felt the Martial Arts community should be doing something to help them. I remember we used have blind people coming to my classes where I taught and the amount of attention they required was tremendous. But you couldn't tell them not to come! I want to see the Martial Arts community helping these underprivileged people, rather than perhaps trying to teach Karate to those who simply cannot do it because of their infirmity. So what do you have lined up in the future? I'm about to launch a new body named the World Union of Karate Associations. This came about because we get a lot of enquiries from abroad about joining UKASKO and whether it's thanks to Britain's international performance or not, it seems most want to be associated with a British group rather than a Japanese one, as was the case a few years back. We receive such a lot of enquiries, especially from the Commonwealth countries, but there's not a lot we can offer them. The usual world body has countries as members, and as these are the governing bodies, so membership is for the favored few. There are many who would like to affiliate to a world body but can't. WUKA will offer clubs and associations that chance and periodically they'll be able to come together for a tournament. So WUKA is not a challenge to existing world governing bodies. I want WUKA to unite people from different nations under one banner. We won't put conditions on membership, we are merely offering a facility for people. Anyone who wants to join should write to the office for an information pack. We will offer a world licence at a nominal fee which will pay for an annual congress for association heads. I also hope we can have an annual tournament, though that may be difficult and it may be better to hold it every two years instead. WUKA can also offer people the possibility of a world coaching programme, using the coaching department from my association.